I know!! I haven't been consistently posting for a few weeks now!! 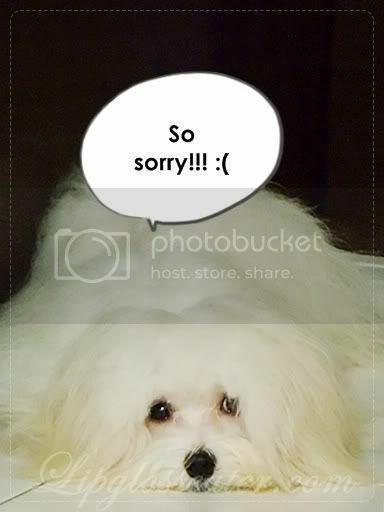 Sooo sorry!! With work picking up plus a cranky internet connect, I'll probably be away for a little while longer. I'll be back soon I promise! Beetrice of Beetrice's Reviews shows us a really ingenious creation - a tampon stun gun! Connie of Skin Deco gets to try out the Bentleys of skin care! The prices are just jaw dropping!! Paris of My Women Stuff makes me itch for the Advanced Night Repair serum from Estee Lauder! Xin of Pretty Beautiful gives us swatches and pictures of the all new Benefit Bella Bamba! Oh be still my heart!! Thats all for now! I have sooo many product reviews to write, but i just wished that i could find the time to!! I need 48 hours a day!! >.< I'll be back soon I promise!